Almonds share the same benefits as other types of nuts — they're high in nutrients and heart-healthy unsaturated fats that may lower your risk of cardiovascular disease. But they also have an advantage because almonds are higher in protein, calcium, fiber, magnesium and vitamin E than other types of nuts, reports the University of Michigan. When it comes to fiber and magnesium, they may have too much of a good thing if you overindulge. The side effects of almonds, when you eat too many, may be diarrhea. One ounce of dry-roasted almonds contains 3 grams of dietary fiber, according the USDA National Nutrient Database. This is a benefit because it provides 12 percent of the daily intake for fiber, based on a 2,000-calorie-a-day diet. But if you're not used to eating that much fiber at one time, or if you eat a large number of almonds too quickly, you may experience some unwanted side effects of almonds, including bloating and diarrhea. To get around this problem, increase your fiber gradually, and allow a few days between boosting your intake to give your digestive tract time to adjust. Fiber absorbs water, so it's also important to drink at least eight glasses of water daily as you consume more fiber. It's possible for raw almonds to be contaminated with salmonella bacteria, which can cause diarrhea, fever and abdominal cramps warns the Australian Institute of Food Safety. The risk is very low if your almonds were grown in the United States because they must be pasteurized to kill bacteria. But imported raw almonds are not subject to the same requirement. Dry-roasted, oil-roasted and blanched almonds are pasteurized during the cooking process. Domestic almonds labeled as raw have been pasteurized either through steam processing or treatment with propylene oxide. Both of these are surface treatments that do not change the nutritional value or flavor of almonds, explains National Public Radio. Almonds belong to the tree nut family, and tree nut allergies are one of the most common, reports Food Allergy Research and Education. If you're allergic to almonds, you'll have a reaction within two hours of eating the nuts. The severity of the reaction can be affected by the number of almonds you eat. Allergic reactions to almonds may involve your skin and respiratory tract, causing a rash or making it hard to breath. But you may also experience gastrointestinal problems, such as diarrhea. Read More: Can I Eat Almonds if I Have Peanut Allergies? The American Heart Association recommends 5 servings of nuts per week, each serving being half an ounce, which amounts to about a small handful of almonds. Almonds contain several nutrients that have a laxative effect if you eat too many. One of these is magnesium, which neutralizes stomach acid and moves stools through the intestines, says VeryWellHealth. The USDA Recommended daily intake for magnesium is 420 mg for men and 320 mg for women. Almonds contain 27 mg per 100 gram so you would have to really binge to get so much magnesium as to cause stomach upsets. Less significantly, the B5, B12 vitamins and folic acid are known to help relieve constipation by stimulating muscle contraction in your digestive system, which helps move stool through your bowels, according to HealthLine. Almonds contain all of these vitamins but you would need to eat a lot of these nuts to make an association between almonds and diarrhea. You might have an issue if you overindulged on almond nut butter, which would be a concentrated form of almonds. 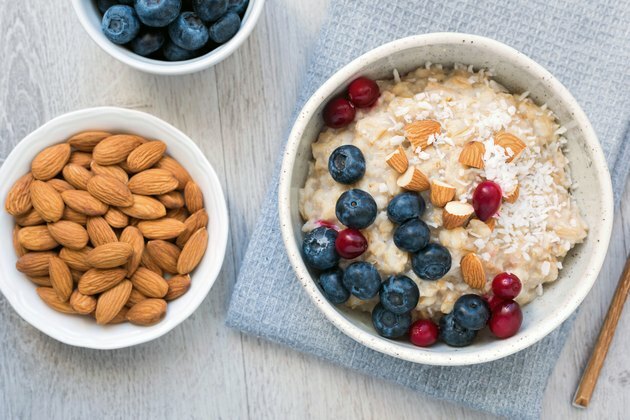 Livestrong.com: What Does Fiber Do for Your Body? Livestrong.com: Can I Eat Almonds if I Have Peanut Allergies?